Amid the towering peaks and forested slopes of Switzerland’s Saint-Gotthard Massif, one of the most ambitious and spectacular projects in the world of winter sports has reached fulfilment this winter. The opening of a new gondola lift marks the final step in the creation of the largest linked ski area in central Switzerland. Admittedly, the lift doesn’t enjoy the snappiest of names. But when it carries such a weight of importance as the Oberalppass-Schneehüenerstock Express does, then who would begrudge it as many syllables as it wishes? The ten-person gondola system is the final piece in a jigsaw which brings together two previously separate resorts to form the now fully joined SkiArena Andermatt-Sedrun. The union, which also forms a liaison between the Swiss cantons of Uri and Grisons, has been a dream for many years and now the twin resort has been lifted into the premiere league of major ski destinations. But what sets it apart from other mere commercial projects is that this extraordinary enterprise embraces a singular spirit of romance and adventure. It’s the culmination of a personal mission by Egyptian billionaire Samih Sawiris, who, at the suggestion of a former Swiss ambassador to Egypt, took on the challenge of leading the rejuvenation of Andermatt. Sawiris’s Swiss-based firm Orascom Development put up very substantial financial backing to make the vision become reality. The achievement is all the more remarkable because he embarked on his mission shortly before the financial crash a decade ago – and has admitted that, had he known it was about to happen, he “wouldn’t have had the guts to commit to the investment – so, I was lucky”. He added: “The good thing is, even if you’ve skied from Andermatt to Sedrun, you can still take the Après-Ski train back if you’re too tired to do it on skis”. At least £100 million has been spent on new lifts and upgrading the ski area – with the redevelopment as a whole said to have cost well over £1 billion. Andermatt, once a small and quiet place (although it was noted for a dramatic James Bond car chase, during which Sean Connery zipped along the nearby Furka Pass in his Aston Martin DB5 in Goldfinger) has virtually doubled in size with the construction of stunning new accommodation to complement the skiing upgrade. But it has successfully retained its great charm, particularly along the historic cobbled main street, which runs from the main bridge crossing the Unteralpreuss river to the Gemsstock cable-car station. 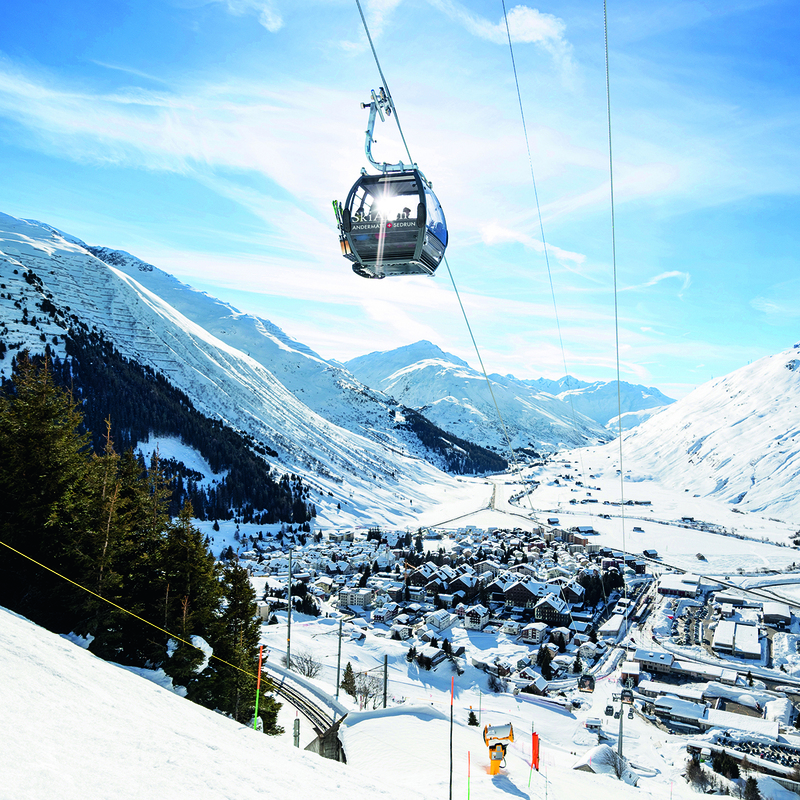 Andermatt has always offered superb skiing for both experts and intermediates. A north-facing bowl beneath the nearly 3,000-metre high peak of Gemsstock, known for its sheltered slopes that keep excellent snow, its challenging off-piste routes, and a fine, sweeping red run that intermediates can happily tackle. On the opposite side of town, Nätschen has a wide range of fabulous, sunny slopes that are perfect for family skiing. Experts have a wonderful choice of black pistes and freeride terrain, but there are also reds and blues where intermediates can hone their skills. But, as of winter 2018, that’s just the beginning. The extensive pistes of Sedrun and Disentis beyond have always been a big draw to Andermatt guests, and on the same Gotthard Oberalp lift pass. But until now it’s been necessary to take a train to reach them. Now skiers and boarders can hop on the new lift, with a red piste also in place to link the two villages in both directions, and there is a further link to Disentis to come soon. Sedrun’s slopes are the most extensive in the area, with glorious open runs, graded red but wide and welcoming, above the treeline. Of course, assorted kickers, boxes, rails and quarters may not be the first things you look for on a piste map when planning your ski day – they’re not mine, either. But if you have some shredders in your party or anyone feeling adventurous, the much admired 600-metre long terrain park at Sedrun could come into its own. It even has a ski and boarder-cross track, with 1.4km of steep-walled curves and jumps. It’s entertaining to ski down the side of the park and watch the spills and thrills at least, even if you don’t want to polish your own tricks! The SkiArena Andermatt-Sedrun now has more than 120km of linked slopes. There’s a total of ten new and upgraded lifts, most of them high-speed and high-capacity chairs and gondolas, giving the area 22 lifts altogether. Extensive snowmaking has been installed, covering most slopes, in case nature needs a helping hand in the long seven-month season. And as you ski these runs you could well be in star-studded company. Winter Olympics hero Bernhard Russi, a son of Andermatt who won gold in the downhill at the 1972 Sapporo games, rates the run from Schneehüenerstock on the Oberalppass his all-time favourite. And the last time I skied there I shared the mountain with up-and-coming local downhill star Aline Danioth and Swedish Freeride World Tour champion Kristofer Turdell, who both find that Gemsstock provides ideal terrain on which to train. The valley floor has sunny cross-country trails for a tranquil change from the downhill variety, and the winter hiking network is delightful. 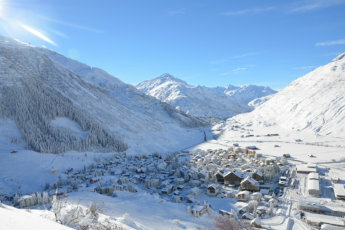 Activities that provide alternatives to skiing are becoming increasingly popular here, including snowshoeing, tobogganing and ice-skating – helping Andermatt set a new benchmark as the complete mountain resort. This ski season sees the official opening of the Piazza Gottardo, the central square of the new car-free holiday village, which lies beyond the rail station and close to the new ski-lifts. It’s just across the tracks from the development’s flagship, the Hotel Chedi, which opened in 2014 (and where guests have the luxury of their own butler and, of course, the hotel has a walk-in cheese humidor). Beyond the Chedi is the historic old village, retaining its great original charm. Shops and restaurants are ranged around the Piazza. The village comprises five further hotels, including the just completed Radisson Blu Reussen, 42 high-end apartment complexes individually designed for an eclectic appearance, 28 chalets and a subterranean concert hall – and no buying restrictions for foreigners.